It is safe to say that Taimur Ali Khan is the most popular Bollywood star kid on the block. Numerous fan pages on several social media platforms that go crazy after one appearance made by Taimur, be it toddling alongside his parents Saif Ali Khan and Kareena Kapoor Khan or in the arms of his nanny— are the proofs of this star kids wide spread fame. In fact, chote Nawab’s white clothes clad nanny is visible in nearly all the shutterbugs’ pictures. Being in front of the camera is the little toddler’s family’s job— not his nanny’s, however, we are sure that the Nawab and Begum of Pataudi compensate her enough! 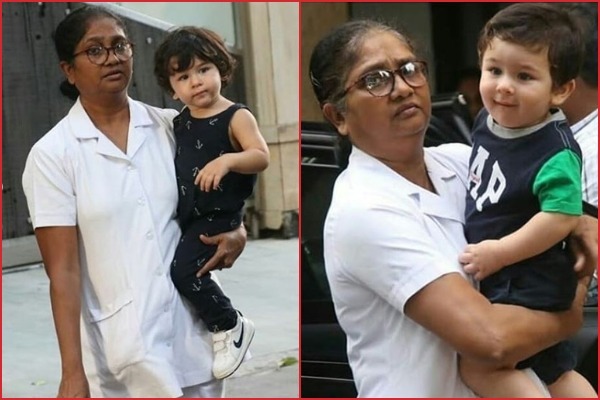 We are sure that you will want to reconsider your career options and think of becoming a nanny once you come to know Taimur Ali Khan’s nanny’s salary! As per several reports, Taimur’s nanny gets paid a minimum of Rs. 1.5 lakh per month! These reports further added that there is a n overtime fee for every extra hour spent with Taimur. This can make the nanny’s monthly salary can go up to Rs 1.75 lakh, naturally, depending on how much extra time she spends at the little toddler’s home or outside. Do you know what this means? It means that Taimur Ali Khan’s nanny earns as much as the Indian Prime Minister! Prime Minister Narendra Modi, according to the official pay slip, earns Rs 160,000 per month. Certainly, Taimur’s nanny deserves every bit of it if she has to parade in front of cameras and run around the energetic little toddler! Equivalent of running a nation, we’d say! In addition to the whooping salary, the nanny has a luxury car with a driver at her disposal to travel with Taimur in and around Bandra. This is not all, the nanny also gets to visit all the exotic, international destinations that Taimur vacations at with his parents Saif and Kareena. The report stated that the nanny was provided to the Khans by an upscale agency in Juhu that helps high profile celebrities recruit domestic helps and nannies. Reportedly, this agency has even provided Tusshar Kapoor and Soha Ali Khan with home nannies for their little ones. Thinking of changing your career yet?